The first Boston University dining hall on what was formerly the Wheelock College campus is now open. The Campus Center Dining Room is located at 150 Riverway, accessible from both the Fenway Campus and South Campus. The new dining hall served the same purpose on the Wheelock campus before the Wheelock-BU merger. As the merger progressed, it was important to find a way to feed students on Fenway Campus, said Associate Vice President for Auxiliary Services Paul Riel. The Campus Center Dining Room follows a similar schedule to other BU dining halls, but closes earlier due to the smaller population of students on the Fenway Campus. BU was able to retain the food service provider, Sodexo, from when the dining hall belonged to Wheelock, Riel said. Sodexo will continue to service the Campus Center Dining Room, and food options will remain the same. 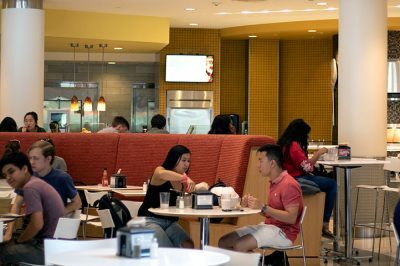 Pablo Cordon, a sophomore in the College of Communication, visited the new dining hall earlier this week, but found most of the stations closed. Sammy Merrill and Annabella Lanza, both transfer students who live at the Fenway Campus, said they eat regularly at the Campus Center Dining Hall. Merrill, a sophomore in the College of Arts and Sciences, said that while the dining hall has limited choices, it is conveniently located. COM sophomore Lanza said she prefers the dining halls on the Charles River Campus. “I would say [the Campus Center Dining Hall is] a little worse, because this one’s catered differently than the other ones,” said Lanza. Currently, there are no planned renovations or expansions to the Campus Center Dining Room, Riel said. CORRECTION: A previous version of this article incorrectly stated Riel’s job title. An updated version of this article reflects this correction. Why is the image used from the Bay State dining hall?